At the 21st CZT Seminar, they gave us some Zentangle® products and also some Sakura products. 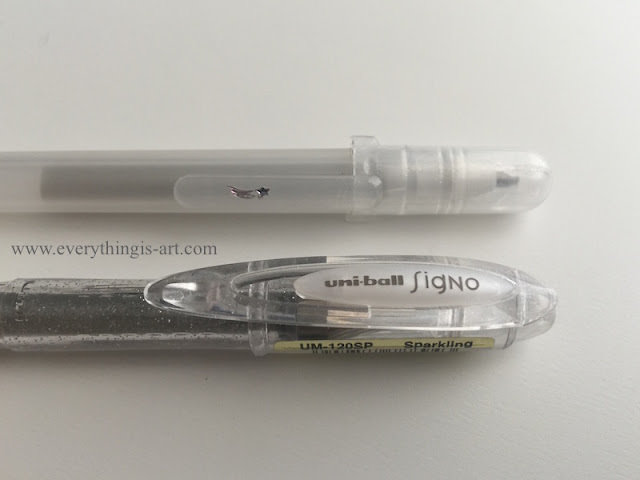 Amongst the many pens they gave us, I fell in love with one in particular– the Sakura Gelly Roll Stardust. It's not a silver pen. I would describe it as having a clear ink with sparkles suspended in it. However, I did find a good alternative. Top is the Sakura Gelly Roll Stardust. It has a pretty shooting star printed on its cap. Bottom is the Uni-ball Signo Sparkling. You can tell the difference from the pen's exterior. The Sparkling has ink that is very much like the Sakura Stardust. The only difference being that the Stardust's sparkles are of a warm-toned silver. You can even say it has a gold hue. Whereas the Sparkling has a true silver tone. 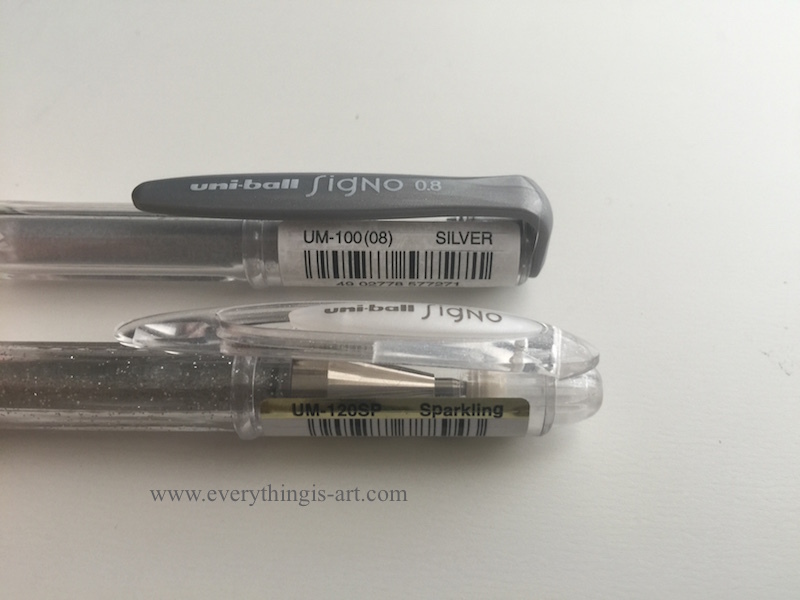 As you can see, the Silver is opaque and looks nothing like the other two pens. So there we go. I haven't found a place that sells the Sakura Stardust, but I do think the Uni-ball Sparkling is a great alternative to it. 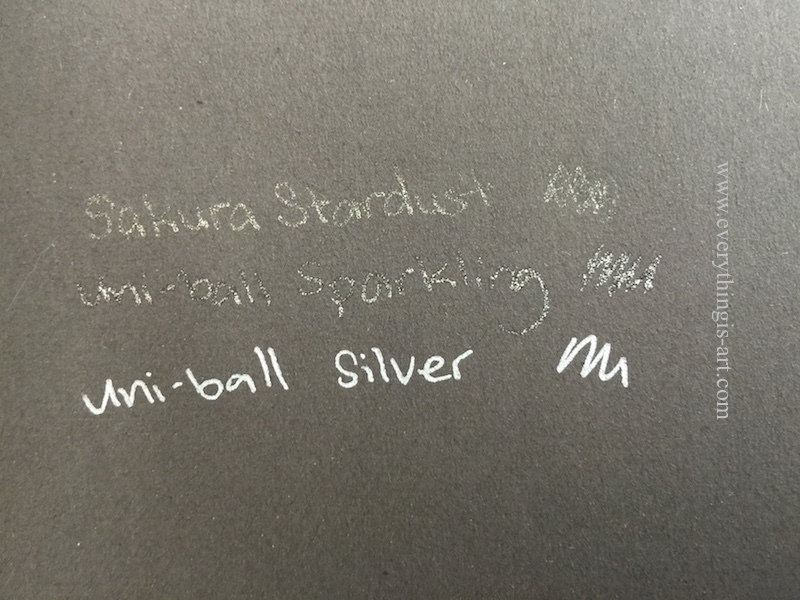 I would still like to find the Sakura Stardust, though, because the Uni-ball Sparkling's glitter does shed a lot more than the Stardust... But we make do with what we have. Hope you found this post informative. And if you know a place in Singapore that sells the Sakura Stardust, let me know in the comment section below! I'm making a coffee date with you today. Commas show that it's not the end.